A slew of new restaurants opened as summer came to a close in Moscow and openings continued unabated throughout the first stage of the Russian financial crisis. It takes months of planning to stage a restaurant opening so despite the plunge of world oil prices, the lifeblood of the Russian economy, with startup costs and leases already committed it appears there was nothing for them to do but forge ahead. We received a notice from manager Kelvin Pang that one of the last to open in 2008, the sports bar/Asian food Buddies Cafe, would open just off Tverskaya on December 28 so we decided to try it out. We had heard that we could expect some pleasant and authentic Thai and Szechuan dishes. 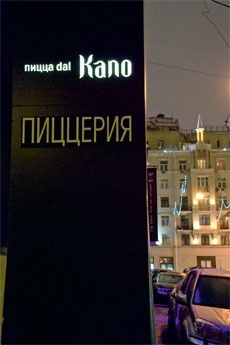 Despite the address at Tverskaya 12, the entrance is off a small side street about a block and a half east on the right side. At the large, black vertical sign on the right side of the street you duck into a courtyard and descend a rock-walled stairway to Buddies. 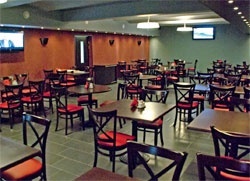 The restaurant consists of two spartan open rooms with a few plasma TVs mounted for sports events. The Szechuan/Thai menu has a touch of Singapore and Vietnam. We started with a selection of hot appetizers: Deep Fried Crispy Wonton (340r), Chinese Spring Roll (320r) and Vietnamese Spring Roll (340r). For the main course we ordered Seafood Fried Rice (380r), Chicken Thai Green Curry Sauce (480r) and Chicken Szechuan Ko Pong Sauce (480r) accompanied with a large bowl of white rice. The quality of the food was good; both the Thai Green Curry and the Szechuan Ko Pong sauces were very tasty if mildly spiced and the rice was perfectly cooked. Buddies is actively promoting itself in the Expat community so our readers should get a good reception at this convenient location in the center. We wish them the best in this tough environment. One of our party was hankering for pizza and we had passed several relatively new restaurants on Tverskaya on the way to Buddies including Pizza dal Capo at the corner of Tverskaya. We ducked in for a look and taste. Once in, it became clear that Dal Capo is part of the “Etazh Project” that also consists of the Picasso Bar night club and a group of Etazh restaurants around town (with one next door) that offer an array of Asian, Japanese, Mexican and Italian dishes. The décor at Dal Capo was inviting with a big vase of red roses nearby and seating at comfortable padded red fabric high backed benches, high enough to provide privacy for each table of diners. The music is jazzy and soft , but this evening the pounding tekno from Club Picasso joined in. From the legs we saw heading down the stairway near our table, apparently at least one entrance to Picasso tracks through Dal Capo. Dal Capo is promoted as Sicilian but from the menu (only Russian available) it appears that Italian chef Vincenzo Abitabile offers a broad range of Italian dishes – Caprese Salad (370r), Spaghetti Carbonara or Bolognese (310r), Grilled Seabass (470r) and even Gazpacho (160r). An American Pizza (400r) is offered with fresh tomatoes, mozzarella, eggplant, mushrooms, spicy sausage, hot dog, olives and sweet peppers. We got our pizza and were satisfied that Da Capo could deliver the goods for Italian near the Pushkinskaya metro station and might make a good business meeting point.